In Part 1, I discussed the shortcomings of WildBlue satellite Internet, and my plan for switching to Verizon Wireless 4G LTE upon deployment in my area. The Pantech UML290 LTE USB modem arrived by two-day FedEx (no direct signature required) on schedule August 17, the day before LTE was scheduled to go live in my area. In fact, I had already heard reports that LTE was up and running, so I proceeded with activation on the 17th. In the shipping box was a box containing the modem, with a USB extension cord and a driver CD. A SIM card was also included. The instructions directed me to call a toll-free number to activate the modem. I did so, and entered the new mobile number associated with the modem, but I was flummoxed when the phone system asked for a password. My Verizon Wireless website password didn’t work. I stayed on the line for a human, who again asked me for my password. I asked for a hint (for example, they often suggest using your mother’s maiden name when setting up the password). She demurred. I verified my identity with my Social Security number, and she asked me for a new password. I gave her one, and she rejected it because it was more than 5 characters in length. That would have been a useful hint, lady. Anyway, she tried to complete the activation and ran into trouble, saying it was “stuck in a switch.” She instructed me to wait an hour, and call a technician at a different number. I wanted to do the initial testing with the modem connected to my netbook, instead of the Cradlepoint router, so that if LTE service didn’t work at my house I could return the router unopened. I decided to install the VZ Access Manager software on the netbook while I waited. Since the netbook doesn’t have an optical drive, and the provided CD wasn’t the newest version of the software, I downloaded the VZAM software using my satellite connection. VZAM detected the modem, and it connected to a 3G signal. Since it previously reported a 4G signal, I didn’t worry too much. As the Klingons say, “If you are sad, act.” I was in the middle of the house, so I went to the front porch and reconnected the modem. It picked up a 4G signal. With this encouraging result, I opened the Cradlepoint router and placed it on my desk, connecting the desktop and NAS’s gigabit switch to the Cradlepoint router. I logged in to the router’s web-based management interface, and went through the basic setup for an 802.11b/g/n wireless network. The basic configuration was straightforward; if you’ve ever set up a wireless router, you should have no trouble with the Cradlepoint. Then I plugged the LTE modem into the router. A few seconds later, I was connected to the Internet. It was utterly simple and uneventful. 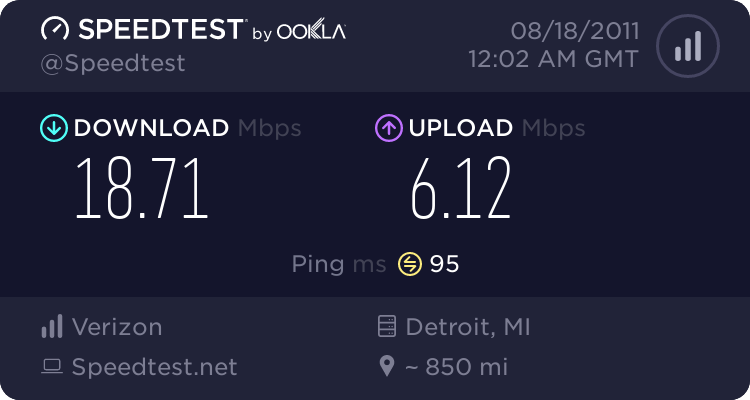 It’s a bit slower than the front porch, but still excellent—and 32 times as fast as the satellite connection. It’s worth noting that here on my desk, the router reports the LTE signal strength as 20%, or 1 bar. The RSSI, however, is –68 dBm, which should provide full speed, regardless of that 20% number. In interactive use, the LTE connection is blazing fast. I don’t mean “fast for a wireless connection.” It’s every bit as quick and responsive as any business or university network I’ve used. Aside from the low 10 GB monthly data cap, the LTE service has been absolutely excellent so far. The data cap keeps me from recommending it as a solution for people with cable/DSL options, but in all other respects it could replace a wired connection. My initial impressions of the Cradlepoint MBR95 are also quite positive. The key capabilities have been excellent so far: The 802.11b/g/n and wired networks work well, and setting up the LTE modem couldn’t be simpler. The router offers a second SSID for a guest network, and it was easy to set that up as an unsecured network, with isolation from the main WPA2-encrypted network that hosts our NAS. I’m finding the user interface a little cumbersome compared to Tomato, though part of that is surely due to familiarity. I haven’t done a whole lot of configuration yet, but I have run into one minor stumbling block: The Cradlepoint router appends “local.tld” to the hostnames of computers on the network to form a pseudo-FQDN. On my Tomato router, I changed the suffix to a subdomain of a real domain that I own, and I have some network configuration that relies on that subdomain. I haven’t yet found a way to change it from “local.tld” on the Cradlepoint. I’m disappointed that the router doesn’t have gigabit Ethernet ports, just 10/100 Mbps, so I still need my gigabit switch for the desktop and NAS. In my opinion, any current-production router should offer gigabit ports. It's just not right that the Ethernet ports are slower than the WLAN, which can go up to 300 Mbps. The router’s internal antennas are sleek and attractive, but I might prefer to have external antennas that could be upgraded in the future. Any possible improvements in LTE signal strength from changes to the position and orientation of the modem, and from using the provided USB extension to move the modem away from the router and closer to a window. The reliability of the LTE connection, especially in bad weather. An improved network configuration, consisting of a split 802.11b/g and greenfield 802.11n network (using both the Buffalo/Tomato and Cradlepoint routers). Future technologies for rural wireless broadband, beyond LTE.